In the prior study recruitment insight, we explored how to know your audience better. But even if we know potential recruits well, the creative content we share with them, from blog posts to video, doesn’t always hit the mark. An image, a tagline, a color, or a text block that works for one demographic might not work for another. And assumptions we make about people and what they might respond to often turn out to be wrong. In order to develop an effective outreach strategy, we need to test our creative content rigorously and improve it constantly. To understand why, think about older adults. It seems logical that they identify with images of people their own age. Surprisingly, they don’t. Elders tend to view themselves as younger than they are, so they respond better to images of people a bit younger. When we create content for them, we need to adjust. 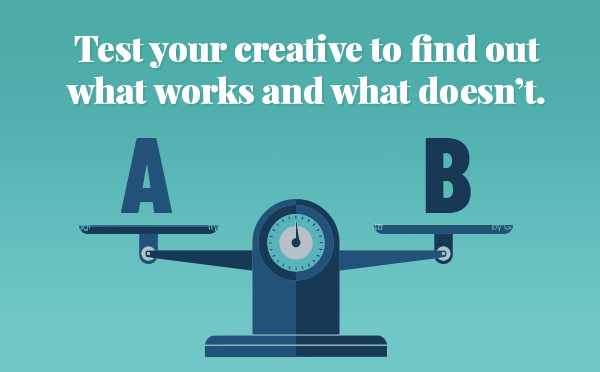 Fortunately, the digital ecosystem makes it easy to test and improve our creative. Doing so can reap big dividends. How big? Our recent recruiting actions have brought in participants for 1/20 the cost of previous. Here are some strategies to help you create a virtuous cycle of build, test, and improve. If you’re creating platform-independent content, few hard and fast rules apply. But you’re not exempt from best practices. As a general rule, smaller and print-based options, such as brochures, tend to be more text heavy. Digital and large-scale options like posters and billboards tend to lean harder on images. Color, font choice, and any number of other considerations play a role. To start with your best initial versions, do some brainstorming. What image might resonate with your audience? What ideas or phrases seem to engage or motivate them? How do they view themselves? If you don’t know, ask. And remember—when developing initial creative, a solid, experienced creative development team is gold. Let their strengths become yours. Once you understand the parameters, design multiple versions. This is where digital shines. For a campaign on the AARP website, for example, we created 30 different variations on a single ad. Then we released them and gathered data. Sharp analysis identified the options that delivered the biggest ROI. This shaped our next design cycle. When looking at data, focus on your campaign goals. It’s not necessarily about clicks, but about the action you want people to take. If your audience isn’t taking the action you want, then it’s time to for a creative refresh, and more testing. To produce variations on creative, try a twist on the obvious. For example, when you think Washington, DC, you might envision the Washington Monument. But for locals, that’s not the city. To them, DC means hot dogs from Ben’s Chili Bowl, an iconic local restaurant, or images of neighborhood parks. When promoting local events to support research recruitment, we have found that using local imagery to reach a geographically targeted audience is a useful idea for creative testing and may improve the effectiveness of campaigns. A creative toolkit can give orgs do-it-yourself muscle. The FTD Disorders Registry works with partner organizations to bring people from their sites into the registration process. To help FTD Registry and their partners, we built an outreach toolkit containing images that could be used across their communications efforts, including email, email newsletters, and social media. Using the toolkit, each organization could build and test creative, adjusting the imagery for their specific audiences to improve ROI. The result? In the first month, over 600 signups, when 100 were expected. It’s amazing how testing can prompt a change that makes all the difference. We Can, a study working to recruit veterans with PTSD for a cannabis study, needed 86 participants. In a year, they hadn’t met their goal. One problem was imagery. Initially, the campaign emphasized people in uniform and images from the research lab, but veterans didn’t connect. The problem? Veterans most often view themselves as everyday people doing everyday things. A more casual approach to visuals helped We Can carve off a big chunk of their goals in just 3 weeks. We’ve explored just a few examples of how the virtuous cycle of building, testing, and improving creative can yield benefits. Please let us know how you’re meeting creative challenges in your own recruiting efforts!